Rent The Pridwin Hotel | Corporate Events | Wedding Locations, Event Spaces and Party Venues. 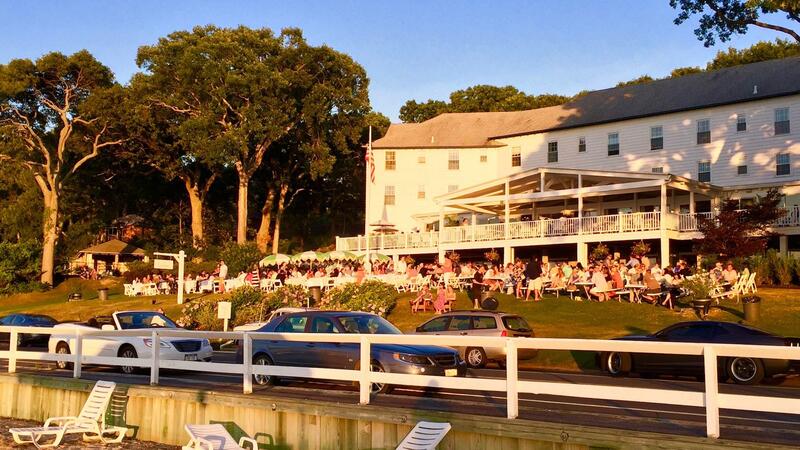 The Pridwin Hotel and Cottages is a classic all-wood American resort hotel that has been providing guests a unique experience on Shelter Island since 1927. The Pridwin is a seasonal hotel that opens in May and is in full swing from the last weekend of June through Labor Day with a range of resort amenities including a private pool, small private beach, two docks, and bar, lounge and restaurant overlooking the bay. With rooms that are considered modest in proportion by some, the hotel boasts a large comfortable lobby, a “living room,” for guests to congregate, play and relax. The Pridwin has a variety of boats for water activities including paddle boards, kayaks, sunfish, a rowboat and one-speed cruiser bicycles for rent, as well as the excellent Moussa Drame Tennis Club, on the premises. Not only do we offer Shelter Island’s most beautiful location, fabulous dining, and unsurpassed sunsets, but we also have over thirty years experience in catering to your every need. Whether your event is a single luncheon or an entire week or weekend of meetings and meals, we can accommodate you and your guests perfectly. The Pridwin offers Shelter Island’s most spectacular location to you and up to 250 of your guests, for an unforgettable day of celebration. Enjoy our relaxed atmosphere, bay views, and unsurpassed sunsets as you dine and dance the evening away amid our gentle rolling lawns and beautiful beachside setting. The Pridwin can help you through all the arrangements needed to make your Wedding Day complete with recommendations for everything from D.J.’s and live bands to florists, photographers, hair stylists, and Justices of the Peace. We can even provide you with a long list of many of the satisfied couples who began their lifelong journey at The Pridwin.